The World Federation of Exchanges (WFE) is trade association of 57 publicly regulated stock, futures and options exchanges (NYSE and NASDAQ are members). They recently published a paper titled “Understanding High Frequency Trading” which attempts to explain the exchanges position on HFT and defend the exchange business model. And which research does the WFE cite? 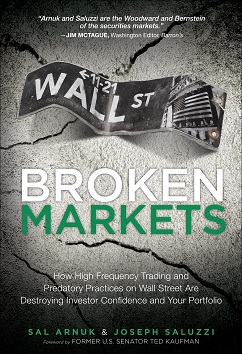 Of course, they cite from papers written by the pro-HFT academics which include Brogaard, Hendershott, Jones and Hasbrouck. Maybe the WFE didn’t get a chance to read the Kirilenko or Clark-Joseph papers or the entire RTL bibliography? We certainly would expect that exchanges are doing what they say in the above statement. However, the WFE failed to mention some controversial issues that exchanges have been criticized for in the past. Payment for order flow, conflicted order types and the sale of enhanced proprietary data feeds all seem to conflict with the WFE goals of ensuring a level playing field. While the WFE tries to defend the exchange model, two of their members were just hit with major fines for rule violations. Last year, the NYSE had to pay $5 million for releasing proprietary data feeds early to a subset of clients and just yesterday NASDAQ was fined $10 million for multiple rule violations surrounding the Facebook IPO. It’s no wonder that the WFE is trying to slow regulators down by urging them to “base any new regulation of automated trading on sound empirical analysis, and appropriately consider the impact of any new regulation on market quality and market efficiency.” Throwing sand in the regulatory wheels is what the HFT community and their enablers do best. ← Tales From The Hoodie – Or – Are Exchanges Too Big to Fail?